Destiny's Child, Hanson, BLT – beautiful creations come in threes, and Samsung's new line-up of three new GALAXY S4s is no exception. 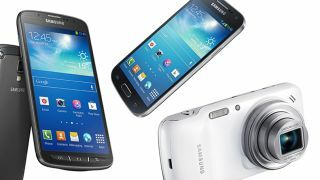 Kicking off with the Samsung GALAXY S4 Active, Samsung has pumped flagship specs inside a water resistant, dust-proof body. Enhanced inside and out to cope with life's knocks and dunks, it couples both hardy hardware and software enhancements to ensure whatever your pace, the GALAXY S4 Active will keep up. Taking the key elements of Samsung's fine flagship and shrinking them down, the Samsung GALAXY S4 mini is the second of the three GALAXY S4 spin-offs. With its more pocketable form-factor and lower price, it's set to appeal to anyone who wants solid specs inside a more compact, affordable body. Finally, it's Samsung's boldest innovation to date, the category crushing convergence device of the year – the Samsung GALAXY S4 zoom. With a 10x optical zoom and a 16-megapixel CMOS sensor, it touts more camera smarts than most dedicated cameras on the market, let alone camera phones. Industrial styling isn't just for show on the S4 Active thanks to its IP67 rating. IP stands for Ingress Protection. It's the scale used to measure how resistant something is to the elements. Each number refers to a different type of resistance, with the first relating to dust, and the second to water. The '6' in the Samsung GALAXY S4 Active's IP67 rating certifies the smartphone as dust-proof, meaning nothing can get in, and nothing can get out. The number '7' refers to the water resistance, with the Active submergible in up to one metre of water for as long as thirty minutes. Thanks to the rest of the phone's smarts, you can be at the pool recording a spot of Full HD video, in the bath streaming a movie or doing a triathlon, tracking your progress and your GALAXY S4 Active can be at the heart of the activity the whole time. In spite of water resistance and dustproofing, the Samsung GALAXY S4 Active is still an incredibly smart smartphone. Not only does it offer the same speedy processor as found in the original GALAXY S4, it also supports expandable memory up to an additional 64GB and packs LTE connectivity. The flagship rivaling specs don't stop there. The Samsung GALAXY S4 Active is the latest smartphone from Samsung to get a Full HD display since the resolution debuted on the original S4 just months ago. This means a pixel density of 443 pixels per inch across the S4 Active's generous five-inch display – pin sharp. So whether you lather on a handful of mud, pour on a pint of milk or trickle a tipple of mojito over your S4 Active, not only will it survive, it will look fantastic in the process. Being the only submergible Samsung GALAXY S4 device, it makes sense for the technology behind the GALAXY S4 Active's camera to be fit-for-purpose, and it is. On top of the 8-megapixel camera sensor and Samsung's trademark, high quality camera UI, the GALAXY S4 Active offers an 'Aqua' shooting mode for underwater action. Enhancing this normally challenging environment, with the S4 Active, submerged stills pop. Its f/2.2 aperture means the S4 Active also captures low-light ambience, flash free, in most light conditions. And what if you want to take a photo in the dead of night? Fret not – with one of the strongest LED flashes around, not to mention an AF assist lamp, you'll get in focus, well-lit shots, every time. Good things come in small packages and the Samsung GALAXY S4 mini is testament to that fact. With its 4.3-inch qHD Super AMOLED display, Samsung's diminutive take on its flagship still offers ample screen size and resolution, keeping the experience premium while shaving off some surface area and pounds.